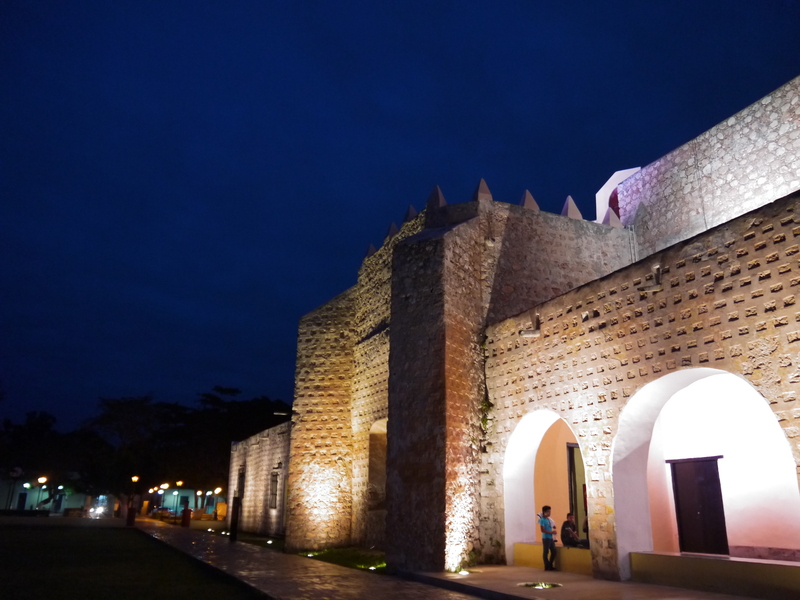 The stunning light and sound show we caught on our first night in Valladolid – projected onto the side of the 16th century Convent we were staying next to – vividly captured the city’s importance as a key bastion of indigenous resistance against the Spanish conquistadores. And if we are to believe their re-telling of history, it became the touchstone for the popular revolt that brought down the government of Porfirio Diaz in 1848 (but then, don’t all Mexico’s cities claim that?). When we stumbled upon Valladolid 170 odd years later, it had retained its colonial charms, but lost none of its swagger. Politically and economically overshadowed for so long by its much larger sister Merida, the state capital, it could have been forgiven for having something of a chip on its shoulder. 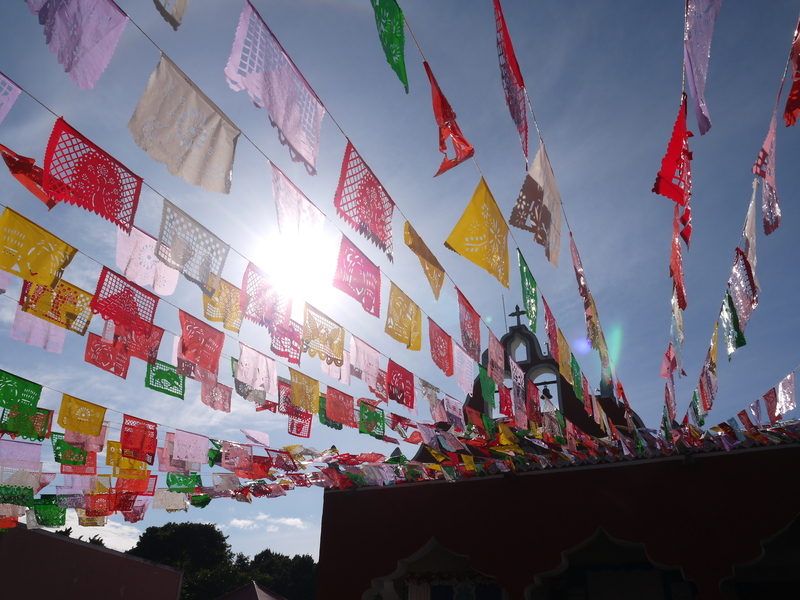 Instead you get the real sense on entering the city, festooned with fluttering lines of papel picado, that the best of times are to be celebrated within its gates. And so it came to pass: the infamous annual Expo-Valladolid had come to town, a riotous carnival of roadside grills, cattle-auctions and euphoric partying until the wee hours to the sounds of Los Angeles Azules (The Blue Angels). We rocked up and tried to get inside the site to no avail – tickets were just five pesos but the queues stretched along the blocks in either direction and looked unlikely to die down anytime soon. Not that we didn’t partake of some cracking scran regardless. 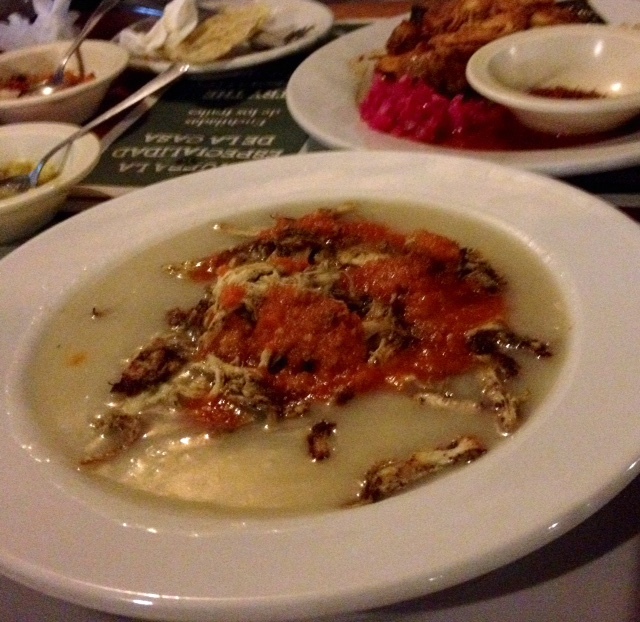 I mentioned in my last post the legacy of the Mayan culture on this region’s cuisine, so we were keen to try some local dishes we hadn’t encountered on our previous trip. Having tried some classic cheap eats at a heaving loncheria (worker’s cafe) set in a market hall doubling as Valladolid’s jewellery quarter, we stumbled on El Jardin de los Frailes (Friars’ Garden) on the road from our neighbourhood into the city centre. A diamond ring whilst you wait for your order? 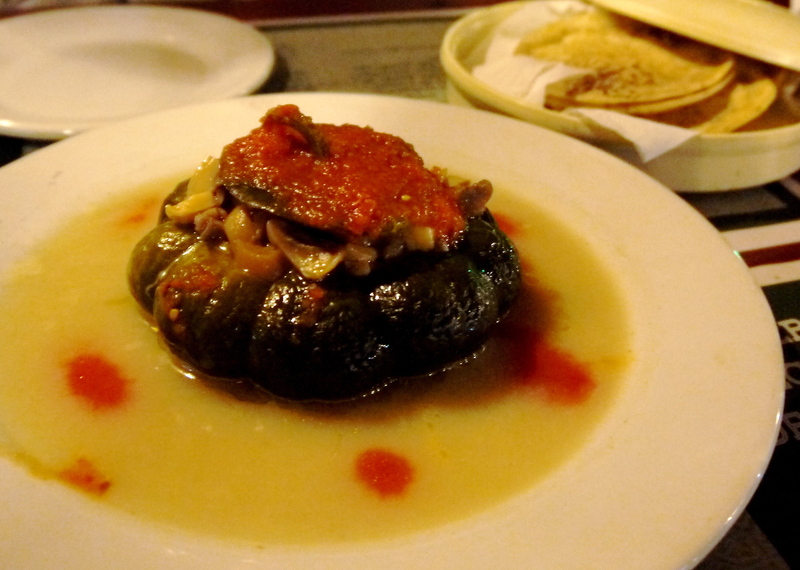 The restaurant was set under a palm-thatched hut at the end of a lush, secret garden. We shared a starter of steamed calabaza (a flat knobbly squash grown in the region), which the waiter managed to appear with incredibly quickly (it might have been microwaved, but it was still really tasty) which had been stuffed with mushrooms and a gooey local cheese referred to everywhere as Edam. Clare’s main course was pollo escabeche – spices including cumin, bay, oregano and a shed-load of crushed black pepper had been blended with the juice of sour oranges to marinate the chicken. It was served in a bowl of thick steaming maize soup, which created the perfect counterbalance to the sharp, complex flavours imparted by the marinade. 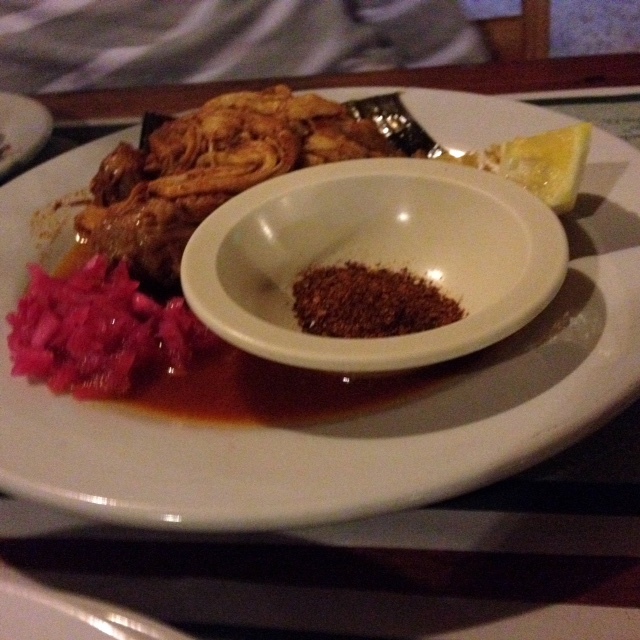 I chose the regional speciality Cochinita Pibil, a famous dish derived from the Mayan cuisine which means ‘suckling pig baked in the ground’ (Pib is the Mayan word for an underground oven). These days it’s rare to kill and cook a whole baby pig to make this dish, so unless you’re at a fiesta pork loin or shoulder tends to be used instead. The combination of smoky garlic and fiery achiote (annato seed, which looks like dried bell pepper flakes) gives the pork a rich, subtle flavour, with the bitter citrus juice from the sour oranges or grapefruits helping to tenderise the meat, so cheaper cuts of pork can be employed. These days the meat is wrapped in a banana leaf and slow-cooked for several hours in a pan to give the effect of baking the pig in the ground, and the results at Jardin de los Frailes were nothing short of melt-in-the-mouth spectacular. 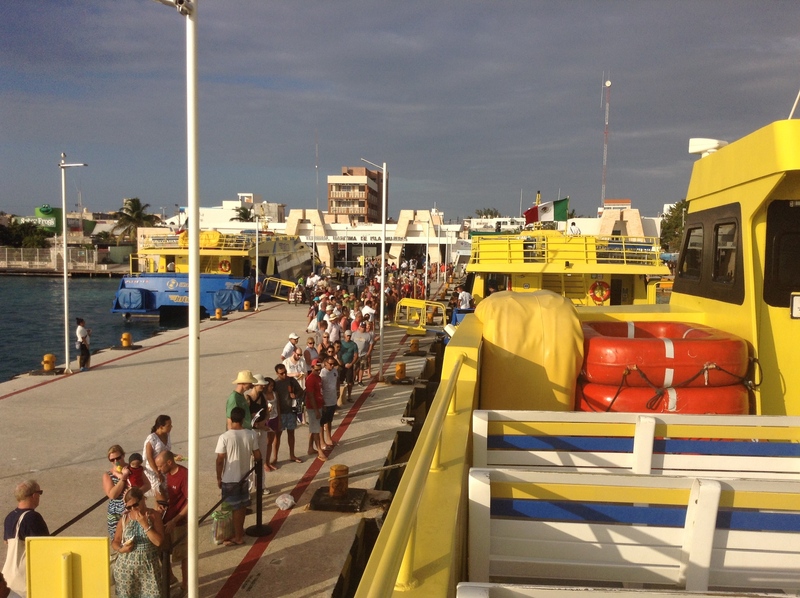 On Sunday we took our leave of Valladolid and embarked on the last leg of our short trip to Isla Mujeres (Island of the Women). At the frenetic bus station in town we mingled with tattoed travellers heading to Merida and locals staggering in the heat under assorted boxes, garden strimmers and electric fans. We hopped on a typically tardy but slightly nicer ADO bus and travelled a couple of hours to Puerto Juarez in Cancun, where we drank beers under a palm tree and waited for another hour before our ferry landed. We took the slower, cheaper service with a few groups of travellers, and made the gentle crossing to the island within the hour. 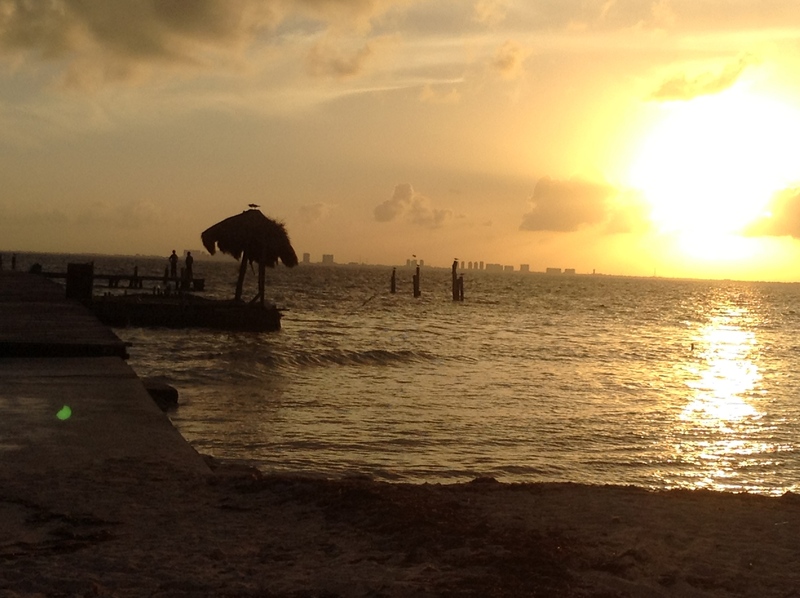 Isla Mujeres is an elongated scribble in the margins of Cancun, still visible on the horizon but a world away in scale and pace. The island become a notorious hideaway for pirates like the infamous Mundaca for over 200 years; they liked to keep their mistresses there, giving rise to its current name. Today it attracts day-trippers from Cancun and travellers trying to ‘get away from it’ – whatever ‘it’ may be – and a fiercely loyal bunch of American ex-pats, who like to share their wistful memories of times before Mujeres became the peninsular’s worst-kept secret. We’d gone a bit crazy and rented a condo in a serviced block with a rooftop pool for the week: it was located the middle of the island facing the Caribbean, a few miles from the urban centre. The flat had been dressed for no-one in particular by someone with an eye for ‘designer’ living; square glass plates contained varnished spheres, great bundles of dried flowers were artfully plonked in outsized vases, spotlights illuminated everything. Its ostentatious decor made us feel a little uncomfortable – by comparison many of the residents’ houses hadn’t been painted and most lacked a complete second storey. But we rationalised the choice as most holiday-makers do in this part of the world – we’d worked hard and saved up, we deserved the breaks. I got my running gear on and checked out the southern end of the island (as I get older I find I have to work out more and more to keep eating what I want to on my travels). Rich Mexican architects had built their homes in prime locations at that end, Duplo-style fantasy residences that made me feel better about our condo. Gringo couples chugged past me in a stately cavalcade of golf carts – the tourist’s preferred method of getting round the 7km long island. Cute paintings by schoolchildren that had been stuck in the verges imploring their parents not to throw rubbish went unheeded. Waves crashed in staccato bursts onto the rocks below me as the fresh sea breeze whipped the palms into a frenzied jig. I tasted freedom in the salty air, and I was glad this was to be our home for the next seven nights.